Iniva’s stand at London Art Fair presents a solo show of recent work by London-based, Brazilian artist Eduardo Padilha. 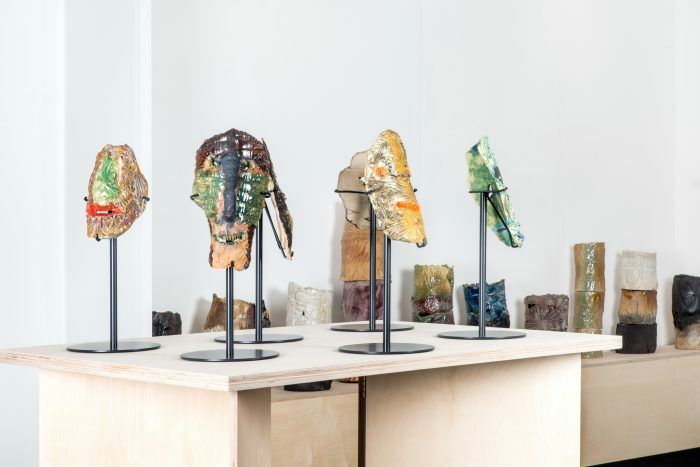 A new series of handmade ceramic sculptures of varying sizes are presented here for the first time in public alongside Untitled (Footballers), a wall-mounted installation of found vintage photographs of Brazilian footballers overlaid with brightly coloured acetate sheets. The formal and conceptual interplay between the two works reflects the artist’s interest in the dynamic aspects of curating and assembling which, in this context, contrasts well with the often static nature of traditional art fair displays. 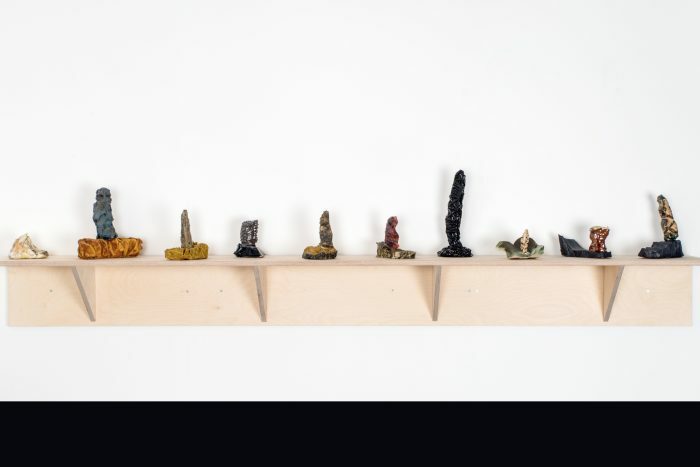 Displayed atop a beech table and plinths designed by the artist, Padilha’s ceramic pieces play with scale as he appropriates the forms of monumental public sculptures. 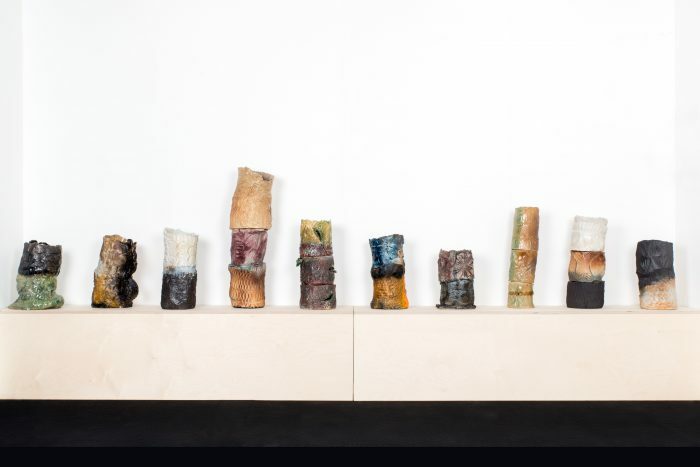 Padilha manipulates the clay intuitively and experiments with glazes to create lustrous surfaces on his ceramics that include masks, small sculptures and larger ‘totem’ sculptures. The latter have been imprinted with re-purposed domestic items and embossed with texture from the surface of found objects. Pieces are created repeatedly so that the gestures and shapes are implied rather than revealing discernible or functional objects: a process which enables different configurations and narratives to emerge within the work. In doing so, Padilha attempts to identify missing links between objects and their environment when they cease to be functional. This new work is an excellent example of Padilha’s ability to investigate the relationship, and disjuncture, between found objects and social environments. Central to his practice is the process of arrangement/re-arrangement within different physical spaces. This new ceramic series will be further developed in a residency in Brazil, 2016 with Grupo Uirapuru, an orchestral group that use instruments made from clay and who invite musicians and visual artists to collaborate with them. Iniva has worked closely with Padilha in the past: in 2000 we hosted a residency and subsequent exhibition that interrogated aspects of the artist’s identity defined by growing up on the border of Uruguay and Brazil; the work also explored how icons become invested with cultural, social and political meaning that often belie their origins.